Trough Steering Sets are manufactured to either Abbey Variable Angle or Abbey Fixed Angle design each consisting of 3 rollers in a trough formation. The variable angle design has the added benefit of the variable side roller which itself can be adjusted to further assist steering set to correct the belt misalignment. The rollers are mounted on a frame. This frame is then secured to a second frame underneath. 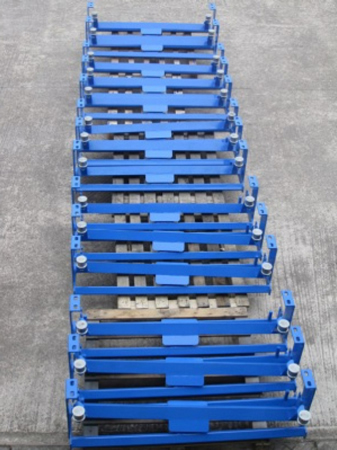 This second frame is what is mounted on the conveyor structure. Between the two frames is a precision engineered turntable consisting of a machined housing with two inverted taper roller bearings inside secured by a machined high tensile bolt .This design allows for side rotation by means of the turntable of the top frame over the bottom frame which is fixed to the conveyor structure. In doing so when ever the conveyor belt goes off the centre line the set will redirect it back on track. 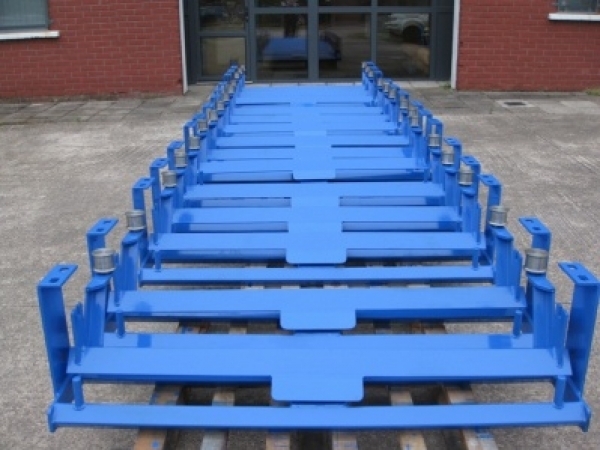 Each steering set has two solid side guide rollers fitted at the top of each side roller to further direct the belt to the centre line and help to keep it there under normal conditions. 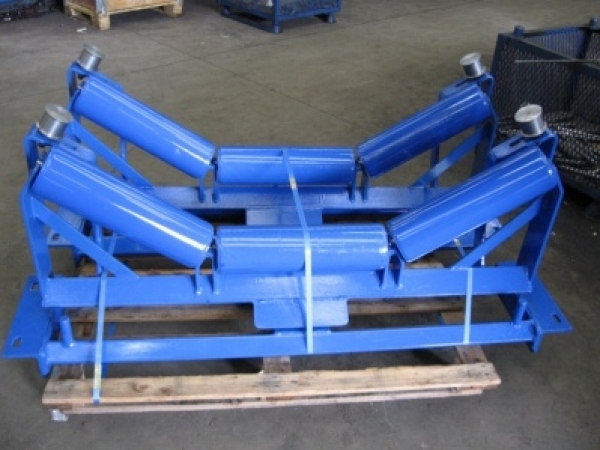 Once the conveyor belt starts to misalign it will first come into contact with either of these side guide rollers. These side guide rollers will then rotate and run along the edge of the belt and instigate the rotation of the top frame and the belt will correctly align again. Steering Sets are usually used on long belts where belt wander is more likely to take place. 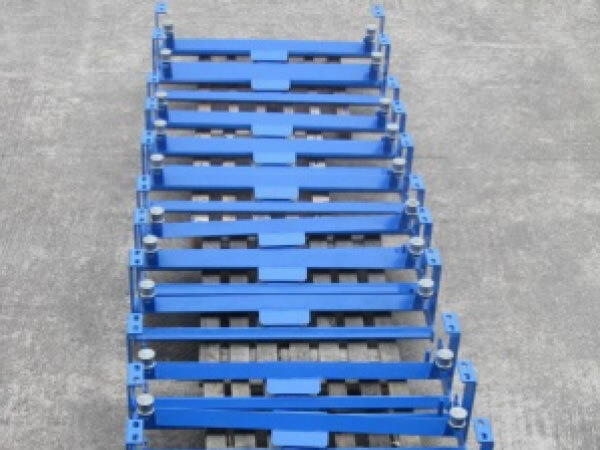 In the case of the trough steering set they will operate as a normal troughing set until the conveyor belt begins to go off centre at which time they begin to perform their necessary function. Our Steering Sets are fully integratable with troughing sets of other makes. Return Belt Steering Sets are fitted to the Return (Bottom) Belt so as to track the unladen belt as it returns to the head drum. 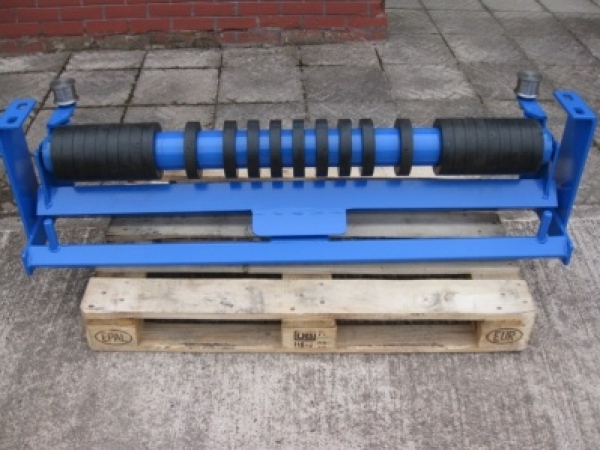 The Return Belt Steering Set has one flat roller which is fitted with rubber discs the full length of the roller. The use of rubber on the roller provides extra traction with the belt further assisting belt alignment. The roller is mounted on a frame which is secured to a second frame underneath.The second frame is what hangs from the conveyor structure. Between the two frames is a precision engineered turntable consisting of a machined housing with two inverted taper roller bearings inside secured with a machined high tensile bolt. This design allows for side rotation by means of the turntable of the top frame over the bottom frame which is fixed to the conveyor structure. In doing so whenever the conveyor belt goes off the centre line the set will redirect it back on track. Each Steering Set has two solid side guide rollers fitted at the top of the frame to further direct the belt to the centre line and help to keep it there under normal conditions. 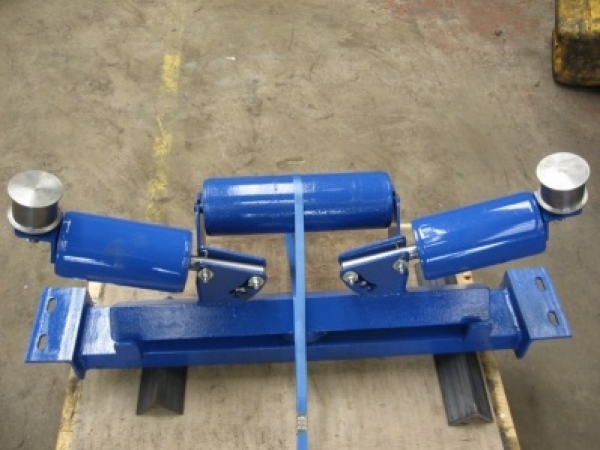 Once the conveyor belt starts to misalign it will first come into contact with either of these side guide rollers. These will then rotate and run along the edge of the belt and instigate the rotation of the top frame and the belt will correctly align again. Steering Sets are usually used on long belts where belt wander is more likely to take place. Our Steering Sets are fully intergratable with troughing sets of other makes.